Friday’s snowfall really helped the trails. More snow fell north and west of Whitecourt. Groomer is out Tuesday and Wednesday around Eagle and Carson trails. Thanks for supporting the Trailblazers and grooming efforts by purchasing trail passes! Compliance has been very good. Trails around Goodwin Lake and Summit Shelter are still a little slick so use caution. Trails to the south of Whitecourt are icy and quad traffic has caused many ruts, use extreme caution. Remember that the trails are for snowmobile use in the winter, not wheeled vehicles. All the money and time spent grooming for sleds is destroyed when wheeled vehicles go on the trails. 279 riders participated on Saturday and 208 on Sunday. The trails held up very well even with the low snow levels. Thanks to all the volunteers, sponsors, and checkpoint people who helped to make the Rally a success. The raffle sled was won by Randy Matthews of Whitecourt. Congratulations and good for you! Weather looks great for the upcoming Rally. Trails are in good condition even though snow level is a little low. Rivers are frozen. Rally route is 60 km each day…follow signs, can’t miss it. Lots of parking at Seniors Hall, follow signs. Registration opens at 8am on Sat and Sun. Checkpoint #2 will open at 8:30 am each day so don’t be too early…Ride safe and have fun! 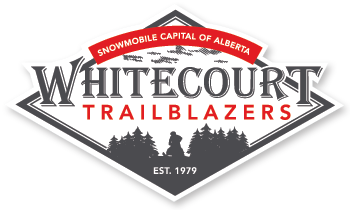 We are excited to announce the 2012 Whitecourt Trailblazer Poker Rally will be taking place February 18 & 19th! North & South routes to be finalized at Wednesday’s meeting. Be sure to attend as there is lots to decide, do and organize. More information to come and updates will also be posted on our website. Summit Trail from Town to Shelter is groomed and back around Goodwin Lake loop to town. There are some big trees to cut along that loop so use caution until volunteers can get out there. If you have a saw, feel free to help out and then let Trailblazers know. Conditions still look favorable for the Big Rally!